The SNES documentation is quite clear about that. Pad should be read 215 (214.55) µs after the VBlank started (NMI Interrupt is trigered at start of VBlank). They state that it’s a good practice to read the pad after DMA of at least 576 byte. One other precaution is to not set the joy enable register during VBlank, if it’s not the case readed data might not be valid. I tried to put it after the proccessEvents(); function but it still seem to not work properly. So I finally set it after the waitForVBlank in the big while loop in main.c. I will analyse some games next week to clarify how they really doing it cleanly. I still need to finalize the tests with tomy from Tototek. Thanks Tomy for all your testing. A quick fix is avalaible here for the yesterday release. There was 2 problems. One for everybody because of a bad tile transformation of the debugFont. And the other one was only visible in BSnes. 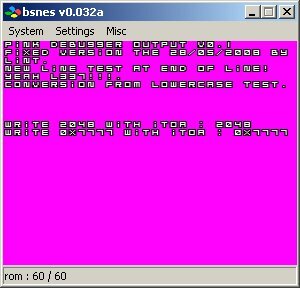 The later bug was due to a bad size of tile being copied to DMA and direct write VRAM for each character writed in debug screen. Now i update the buffer (debugMap) and i DMA copy it in one shot in VRAM. So now that everything is fixe, please enjouy the code. I modified a bit the routetine for writing to screen. Don’t forget to make your string finishing with a “\0″. I added also support for new line and line bigger than 32 character. No scroll support when too much is writed to the screen. It might come quick I think. It’s been a while that I haven’t posted working code on my blog. As promised i come with mosaic and fade effect and very small debug output. I will come bacl on debug fonctionnality a bit later. The two gfx effect I provide here are more than just the effects it’s a whole event managing system trigered by the NMI interrupt. I had some issue with NMI for about a week but now everything is starting to become clear in my mind (I will come back with this problem in an other post). As you can see there is an initEvents that need to be called before adding events. The processEvents function need to be called in the NMI handler. The events them self are simply stored in a double linked list for managing ease. I’m sure you saw the EVENT_CONTINUE and EVENT_STOP. In fact the callback function is needed to return a char that specify the processEvents function if the event still need to stay in the event list or if it should be removed. The removeEVent function is called internally in processEvents. So now managing events triggered by VBlank/NMI is all easy. So now the debugging facilities… Hmm not yet totally implemented like I wished. The font is there, the basic function is there… So what’s missing ? printf like functions for being able to display on the debug screen, some more code and memory space to backup VRAM and CGRAM so we are able to restore the previous screen config properly, many code cleaning is needed in debug part. So I just make this realease, even if everything is not coded as I wished, but it’s been a while that I promised a release. So expect more debug stuff to become reality. You can test the events in the archive by launching the rom.smc file and pressing up or down to play with mosaic and fade effects. Pressing left make the screen scroll left while right make it stop. The is a small isuue with the fluidity of the left scrolling. I don’t know if it’s a NMI timing issue in the emulators or if it’s my code. If someone can test that on real hardware you are welcome to give me feedback with a comment on this post. Full archive is available here as usual. There is now a makefile provided instead of the make.bat, if any problem get in touch with me. There is a few items that I’m currently really interested in. Most of those stuff are not really ***RARE***, but I don’t really have tons of money to go in those items. So … if you see one of those, if you own of those, just get in touch with me. It’s been a few weeks that im looking for a copy of WILD GUNS for SNES. It’s really a wonderfull game that was released at the and of the SNES official life. Not a lot of cartridge were produced and then it’s a bit difficult to find at a good price. I don’t need boxed game with instructions. Cart only is ok … in pal, US or japan favor. Here is a youtube video to show you what type of gameplay it has. More wish list comming soon … with certainly some ***RARE*** stuff. I finally finished to plot the font for my debugger. Hmmm not really a debugger. Currently it will just be a buffer that you can feed with stuff you wanna to print out. Then when pressing L+R+Start you will have access to what you decided to output. If you use my C functions to setup screen, you will be able to restore the whole thing when unpressing the dedicated buttons. Can be quite practical. Don’t worry the debugger will have way more feature. Yesterday I discovered a new forum. Well not really a new forum but one that I never noticied before. As you know nesdev.parodius.com is good reference about various documentaion on the NES and even some in the SNES area. Gato pointed me out that there was a forum associated with the site. The forum is like the site, being oriented at NES dev but there is a forum slot dedicated to SNES. I recently got a comment through the comments of my latest post. Gato seems to have problems using C libs provided with the WDC compiler. What are really those C libs and what are the functionnality they provide? There is plenty of website providing more info on those libs. Don’t hesitate to use Google for more info about them. I will now show only a part of the C standart librairy : stdlib.h and string.h. - causes the space pointed to by ptr to be deallocated. You should use those carefuylly since they may not be perfectely optimised and then take a large space into your final ROM. So now ? Maybe a small example to illustrate all this. 3 simples steps : code , compiling and finally linking. Two lines for compiling, please refer to the doc for the purpose of teh differnet parameters. The -MS is for specifying the model, it is important to specify when later you need to specify the lib model. The cs lib is for the Model Small that we specified while compiling. As usual you can get the full archive to download here. PS : shoot your comments as usual ! Once again an other issue. This time it’s about the WDC linker that seems not to be able link against C library. I already have sent a few email and ticket support to the wdc team. Still no response since my first enquiry 2 months ago. It’s been a while now that the direct to the freesdk have been removed. // check if pad is READY !!! Copyright (C) 1992-2006 The Western Design Center, Inc. The __~mov symbol cannot be resolved but it is in the cs.lib. So I think that the linked dont link correctly. If anyone got any any idea on why. Feel free to leave a comment. PS : I’m still working on the two effect and debug text output, expact an update in a few days. FIXED !!! Look at the comments !!! You are currently browsing the SNESDEV blog archives for May, 2008.